Who could think that the toilet paper roll can be transformed into such an amazing sculpture? I’ve never thought of that because it always ends up in a trash bin. When I first saw the creations of Junior Fritz Jacquet, I was surprised. Junior Fritz Jacquet is an artist who uses paper as his tool in creating wonderful art. At a very young age he was fascinated by paper. He explored and experimented on different kinds of techniques for crumpling and folding to enhance his skill for his masterpiece. Most of his artworks are made out of paper and cardboard, which makes it more interesting. 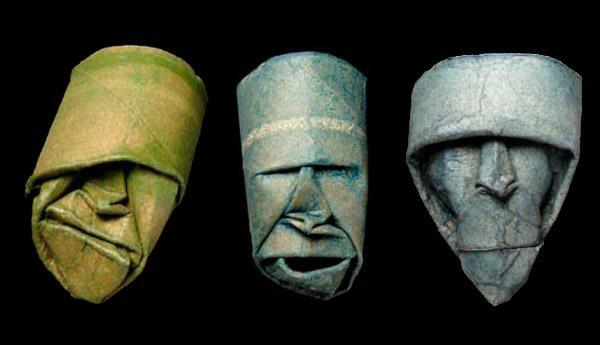 One of his popular works is the tribal mask that is sculpted by hand out of toiler-paper rolls then will be coated with shellac and different pigments afterwards. When you look at them, their expressions tell stories that will definitely challenge your imagination. For more updates of his works, feel free to visit his website and Facebook page and enjoy looking at some of his masterpiece. If you want to see more, I also included a short video of Junior Fritz Jacquet doing what he loves to do. Making art! Are you fascinated by his awesome skill and want to give a try? So, what are you waiting for? Start collecting those paper rolls and make your own masterpiece and link it in our comment section!